13 copies are signed. Two copies are known to be destroyed. 1972 Two colors 16" x 24"
War is not only absurd, it creates the absurd. World War One shoveled millions of men against impossible barriers of barbed wire and machine guns, to die miserably, pointlessly squabbling over a few yards of filthy mud. Between 1916 and 1923 Western European artists and writers absorbed this great lesson in futility and meaninglessness, and turned it to artistic ends. Dadaism is dedicated to the discovery of authentic reality through the abolition of traditional cultural and aesthetic forms by a technique of comic derision in which irrationality, chance and intuition are the guiding principles. My dear friends Charles and Lindsey Shere are great admirers and collectors of Dada and Surrealist art. 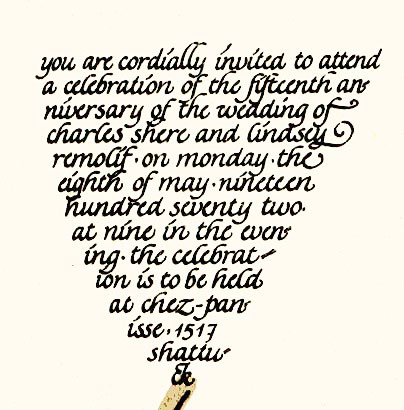 This invitation to their fifteenth wedding anniversary dinner is written in ornate, curly letters. The writing is furthermore small and hard to read. As you try to decipher the message, you have to peer closely and read slowly, and as you stand there with your nose almost touching the image you realize that people are looking at you strangely and all at once you gain a great understanding of the central principles of Dadaist expression.